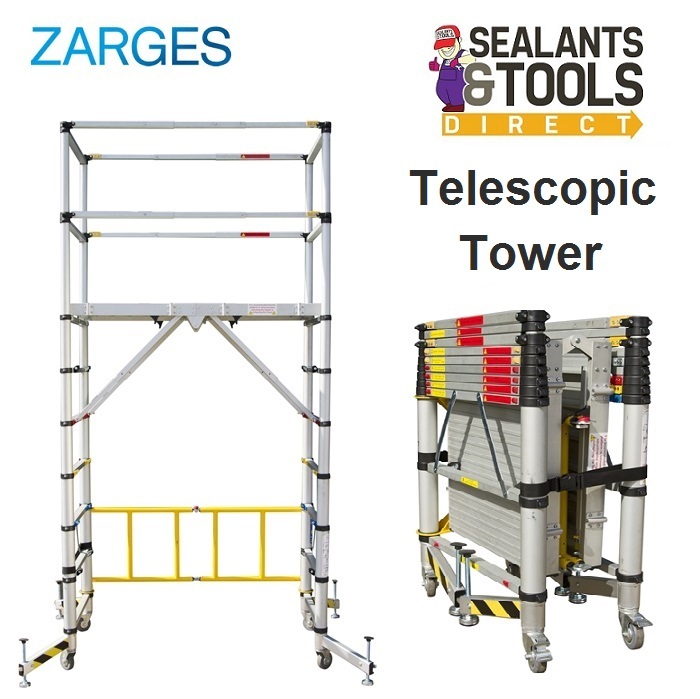 This Zarges TT002 Aluminium Teletower has a unique patented telescopic operation which means it's very easy to transport, store and erect. The Teletower offers a safer, more efficient and lower-cost alternative to fixed scaffolding, podiums and other mobile access towers. It is suitable for DIY, trade and professional applications, and replacement parts are readily available. Safety and quality is of paramount importance when manufacturing Teletower products. All products meet the requirements of the Work at Height Regulations of 2005 and also comply with PASMA's recommendations relating to safe method of tower build. Telescopic mechanism allows 7 different platform heights from 0.33 to 2.00m (0.33 / 0.61 / 1.00 / 1.25 / 1.50 / 1.75 / 2.00 working heights from 2.30 to 4.00m), there is a large folding aluminium work platform (1.4 x 0.7m) with climb through hatch, and it is fully erected in under 3 minutes, saving down time and man hours, plus it can be transported in a small van or estate car and has a single person operation. It can operate as a podium with low level fixed height options of 33cms and 61cms, comprises only 2 parts - tower and platform (no more leaving parts in the yard!). It has integral stabilising legs with 5 optional positions and lockable castors, integral telescopic hand and knee rails, and integral platform stabilisers.